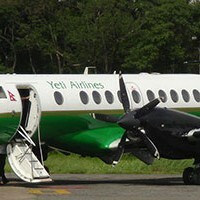 Yeti airlines operates 6 flights daily each between Kathmandu and Pokhara. Starting with one DHC-6/300 Twin Otter, the company now has the largest fleet of fourteen aircrafts. The airline has served the isolated population of Nepal living in far-flung mountain areas by providing the only means of transportation and connection to the outside world. Yeti Airlines Domestic Pvt. Ltd. started operations with two DHC-6/300 Series ‘Twin Otter’ aircraft flying to remote areas with STOL (Short Take Off and Landing) airports like Lukla, Phaplu, Lamidanda, Rumjatar and Simikot. Within the last 15 years, they have strengthened and grown to become Nepal’s premier airline. The claim to have the largest fleet of Seven British Aerospace ‘Jetstream-41’ ; covering major cities within Nepal from the mountains and hills to the Terai region; they maintain and fly the largest and most extensive destinations network in Nepal.